Lefebvre | Beer Apprentice - Craft Beer News, Reviews, Interviews and Info. Hi guys. How’s it going? For today’s craft beer review I’m going to be trying the Hopus Ale made by the Brasserie Lefèbvre SA located in Rebecq-Quenast, Belgium. I’ve seen this beer at bottle shops before, but for some reason I’ve never given it a try. I hope it’s a good one. From the website, brasserielefebvre.be, I found this rather lengthy, but interesting bit of info regarding the Hopus Ale. The work of the master brewer for the development of Hopus focused on the selection and implementation of hops in a manufacturing process in the purest Belgian brewing tradition.After two years of research, 5 hops from the best vineyards distinguished for their flavor and harmonious marriage. Hopus The tasting begins even before uncorking (and this is what it is, and not of uncapping). Manual opening is unusual, invites truly tasting and excites the taste buds of connoisseurs of fine beers. Deep gold color, it has a beautiful white foam, smooth and stable. Yeast fermentation sticks well to the bottom of the bottle and pull away as dust. There is no doubt that fans of beer yeast in delight. On the first nose, aromas of hops and high fermentation leave no room for doubt: it is the presence of a typical strong and bitter beer terroir. This feeling is reinforced by a strong carbonation that gives it its power. The attack is frank with direct feeling of bitterness along with a festival hoppy notes. On the palate, the fruity side of high fermentation aromas and flavors of malt perfectly rebalance the attack without the mask. The taster is well prepared for the grand finale: the post-bitterness. Qualify it seems high in understatement. It is tough without being intrusive, powerful without being cloying, elegant without being opulent … in short, a perfect preparation for the next sip! Alright. Let’s give it a go. This brew had an ABV of 8.3% and it came in an 11.2 oz. bottle. It discharged a hazy yellow color. It kind of looked like lemon-aide actually. The cap was white, quite small and fizzy with several large bubbles around the edges. The retention time was not all that great and the lacing seemed to be a bit underscored as well. 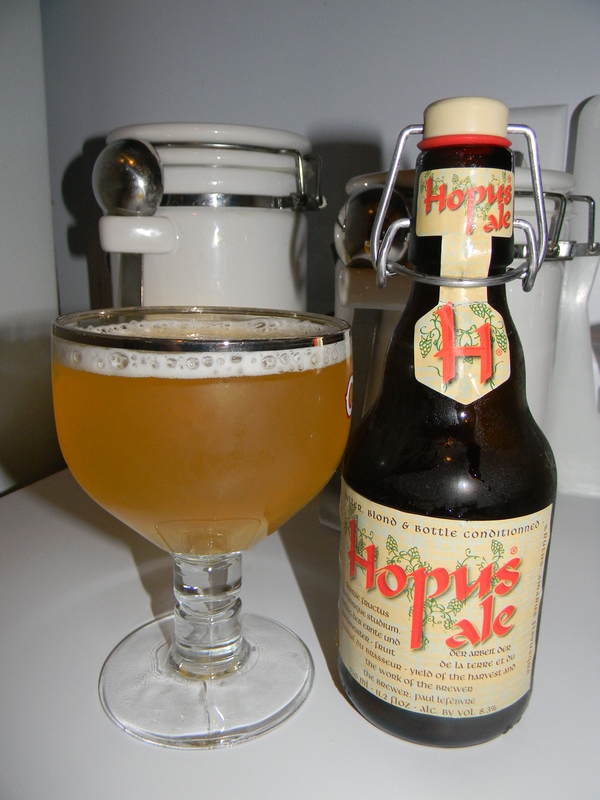 The nose smelled, to me, a lot like a Belgian Tripel….. only lighter. Tones of lemon citrus and not quite ripe “green” pear. Hints of grass and grain intermingled with wafts of yeast and wheat. A bit of peppery spice and minute amounts of funk. Overall, I found the bouquet to be fairly nice, however it wasn’t nearly as robust as I thought it was going to be. The flavor didn’t seem to be as complex as the aroma, plus it seemed to be even more restrained. A very lightly soured lemon citrus sweetness along with some floral hops started it off. More of the grains and grasses followed. No alcohol, no spice, nor any funk was discovered. The yeastiness was almost non-existent too. Hmm. The mouthfeel was medium to thin bodied. Quite watery, but smooth, crisp, refreshing and thirst quenching. The carbonation was decent, but the flavor vanished from the palate kind of quickly after each gulp. Well, this would be a great Summer beer for sure. It had a killer drinkability and it was super refreshing. Especially for an ABV of 8.3%. Although, I was expecting a bit more “oomph” from it to be honest. I didn’t find anything off putting or out of the ordinary per se, but I wasn’t extremely impressed either. I’m glad I gave it a try and I’d try it again if it were offered, but I doubt that I pick it up again anytime soon to tell the truth. Hey, don’t take my word for it…. give the Lefèbvre Hopus Ale a test drive and decide for yourself. You may find it to be outstanding…. and I hope you do. I must say that it does come in a very cool looking bottle. Today, I’m going to review a beer from the Lefebvre Brewery located in Brasserie Lefebvre, Belgium. 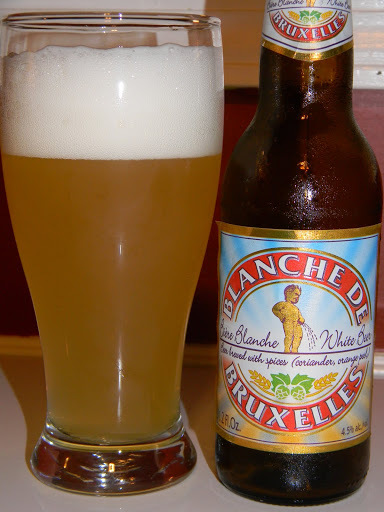 It’s a Wit beer called the Bier Blanche De Bruxelles. I don’t know much about this brewery and I can’t say that I’ve ever had a brew of theirs, so let’s see what the website (brasserielefebvre.be) has to say about it. This beer came in an 11.2 oz. bottle and has an ABV of 4.5%. It poured a hazy, yellow/pineapple juice color with a bright, white, fluffy, soapy head. Very nice size, but it only had moderate retention and lacing. Some extremely light yellow highlights adorned the bottom of the glass. It definitely looked like a Wit beer. The smell revealed a spicy coriander with both orange and lemon citrus accents. A controlled wheat note was present along with a slight “beer” aroma. In some ways, it smelled like a sweet tart. Overall, it was well balanced, but conservative. The taste had both the orange and lemon citrus combined with touches of sourness and bitterness. A very peppery spice along with the coriander was mixed with wheat and a yeasty, grain”y” bill. Again, decently well balanced, however it was controlled and low-key. The mouthfeel was medium/light to mostly light. It was smooth, crisp, thirst quenching and refreshing. A bit of a watery mouthfeel that didn’t leave much, by way of flavor, on the palate. To me, this brew didn’t have a whole lot to it. Sort of middle of the road as far as aroma and flavor go. It’s super easy to drink and it would be no problem to set several of these back during the warmer days of Spring and Summer, however I didn’t find it to be anything too complicated. Mostly straight forward. If you favor Wheat/Wit beers, pop a cold one and give it a try. It may suit your needs perfectly. I would have no problem drinking it again if it was offered, but I may not go out of my way to find it however. I will say that I love the label. Haha. Thanks for reading everybody!!! I hope everyone has a great weekend. Cheers!!! !